Charming and beautiful apartment located in the heart of historic Port city. The sweetest apartment in town! The Belly Angel apartment is on top of one of the oldest Pastry Shops in Port center where you can have your breakfast included on the price. The Belly Angel is a charming and beautiful apartment located in the heart of historic Port city. From the balcony you can admire the famous Clerics Tower, the Portuguese Center of Photography and the beautiful Cordoaria Garden. Large, spacious and sunny space with 55m2. The large bed room and a sofa-bed convertible on the living room makes it a comfortable place for two where can accommodate three. Two bathrooms with shower. Towels and bed sheets are Provide. Kitchen with fridge / freezer, stove and microwave. With the Necessary equipment for cooking During a short stay. You can eat a lot of cakes downstairs because it's a 3rd floor without elevator! The quartier is not only surround by monuments, but Also great restaurants, shops and traditional grocery's. A few 5 minutes walking from the Arts quartier Miguel Bombarda and 2 minutes walking from the quartier of Paris Galleries full of trendy bars and the heart of Puerto night spot. During weekends the quartier is full of street markets where you can find a little of every thing! You can Also take a beautiful 20 minutes walking till the riverside - Ribeira. Several buses stop, included tourist buses, are just across the street and 10 minutes walking distance from subway and train station São Bento. Direct bus from the airport. Traditional Trams stop just across the street! Our stay at this VRBO property in central Porto was ideal in many ways. 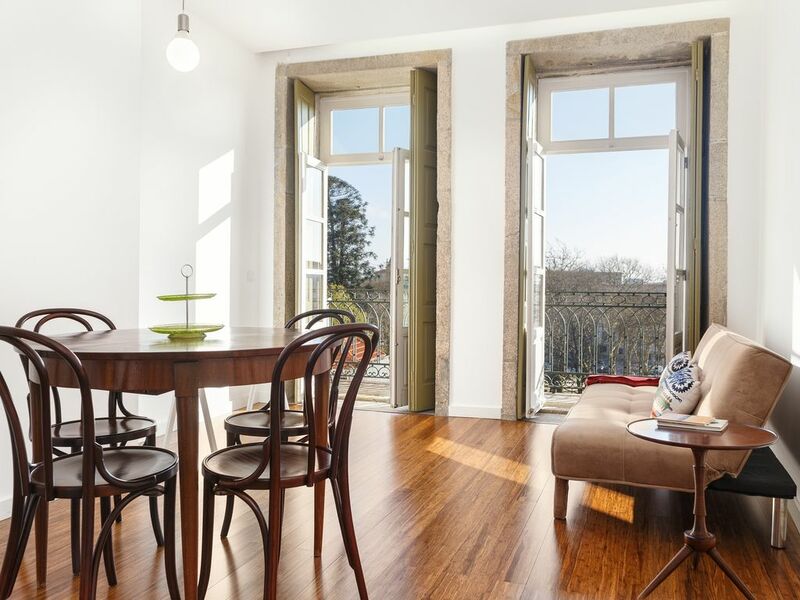 The location was perfect, in the heart of Porto, walking distance to everything. The flat itself is very cute with remodeled kitchen and bathrooms (2) but otherwise retaining old world European charm. Our hosts were very accommodating and helpful. There were two matters that detracted from our stay: the mattress was very poor quality and caused me sleepless nights with aching back; and the lighting in the flat needs improvement. There is no lamplight and the overhead lighting is inadequate making for a "cold" atmosphere at night. Other than those two things, highly recommended. A real gem of an apartment in a great central location! Loved it! We had a great time staying at this apartment, it was a real sun trap, spacious and clean and had a cute little balcony! The hosts were very welcoming and as it was above a bakery we had a lovely breakfast every morning to set us up for the day! The area of the apartment was also really central, close to shops, tourist attractions and lots of cool bars and restaurants, although still seemed nice and quiet so we slept really well. We absolutely loved Porto and this apartment was in a great location. Staying above the bakery provided wonderful aromas to wake up to. Elisa and Luis met us the bakery which was very convenient. We were a bit disconcerted to find earplugs with the towels but just the first night was a bit noisy! It added to the flavor of the city. Lovely apartment with friendly owners - all with an excellent breakfast thrown in. Quite a few steps so maybe not for everyone. Did get noisy in the Square outside on Saturday night. Recommended. We stayed a week in the apartment and it was as lovely as the pictures! It is in a very central location within walking distance of lots of great spots to eat and sight see, as well as the train and metro stations. Thank-you for a great stay! Immaculate appartment in central location. We have spent 11 nights at Belly Angel and it has felt like home. Our hosts at the bakery have gone out of their way to make this a truly memorable vacation. The apartment is spacious, spotless and has a wonderful balcony at the back to sit out on after a long day of sightseeing. It is a refreshing change to stay in an apartment where everything..... toiletries, cleaning items etc are in abundance and we did not need to buy anything ourselves. Going down to the bakery for our breakfast every morning was a real treat and this is all included in the rental price. Porto is a magical place but the people are what make it. They go above and beyond to make visitors feel welcome. Having stayed at many apartments throughout Europe we think that Belly Angel above Primar Bakery has been the best! Thank you Elisa & Luis for the warm welcome on arrival ..... the bottle of wine and the delicious pastries..... very welcome after a long day travelling from the UK. Thank you for all suggestions of places to visit and the map and explanation on arrival. You have been charming hosts! If anyone reading this is considering staying at The Belly Angel....... book it...... you will love it! It was our pleasure to have such a great people at our apartment! Pequeno Almoço incluído no preço a ser tomado na confeitaria do r/ch do edifício. Todos os dias excepto sábado, pois esta está encerrada.